They say copying someone is the greatest form of flattery. In this case, it’s to show that an item can be wildly over priced. I found this wall art on urbanoutfitters.com. 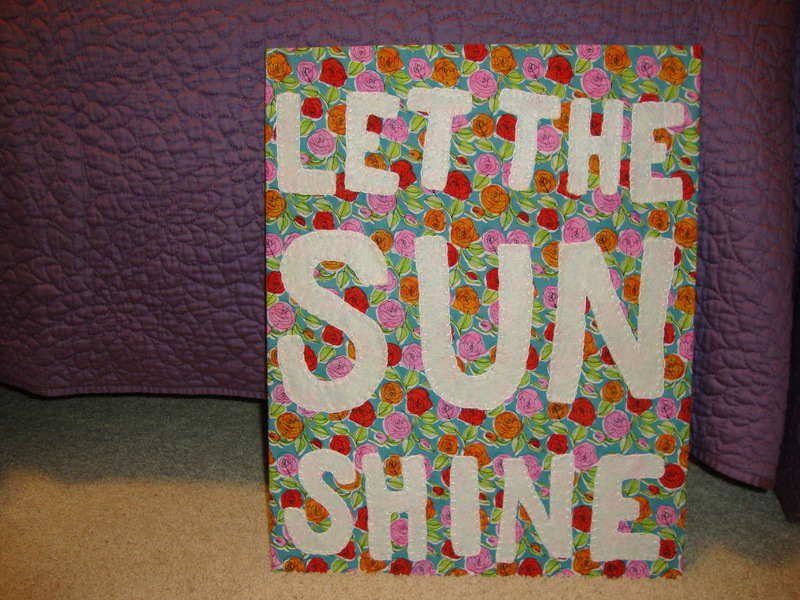 Their price was $59 – I was able to reproduce it for only $6. 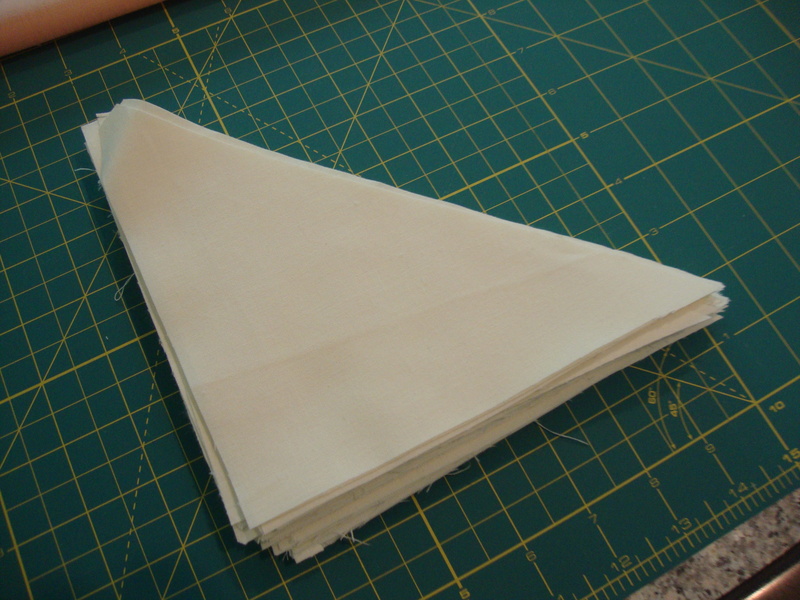 All I needed was a 1/2 yard of fabric, 3 sheets of felt and some embroidery thread. 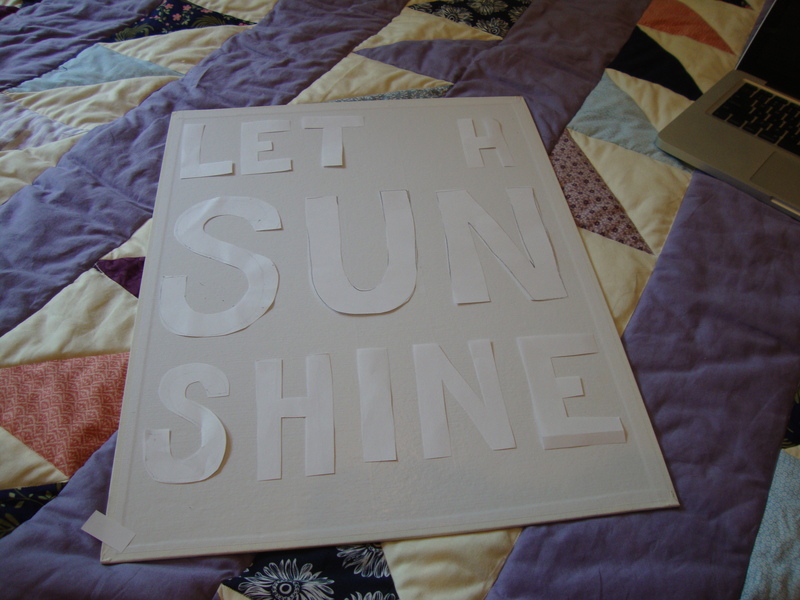 First, I cut out the letters using paper to act as a template (so I don’t waste any fabric). 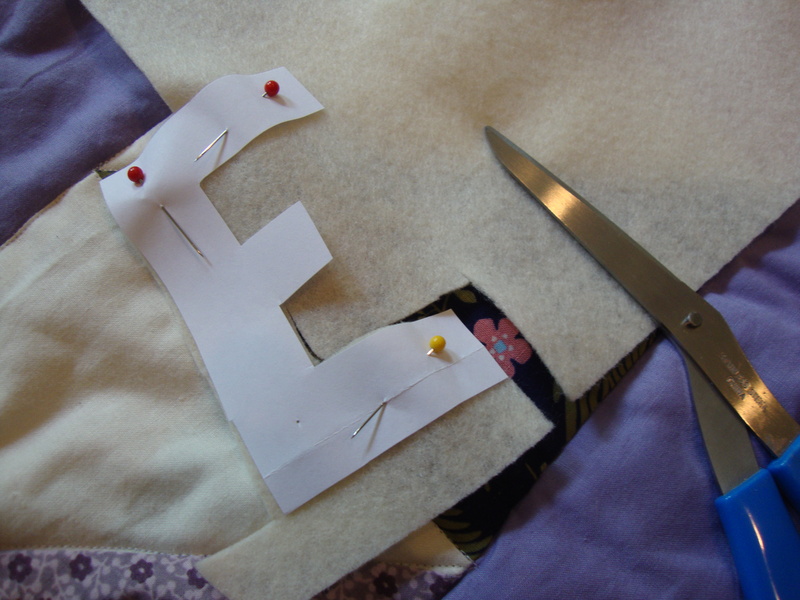 Next, I simply attached the felt letters to the back fabric using a blanket stitch. I couldn’t help myself. 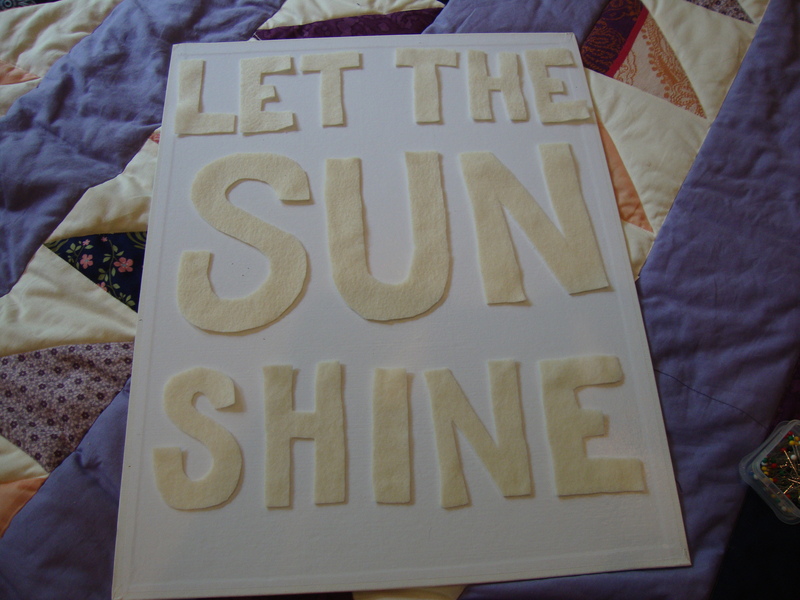 The day after my last day at work, I started making another quilt. 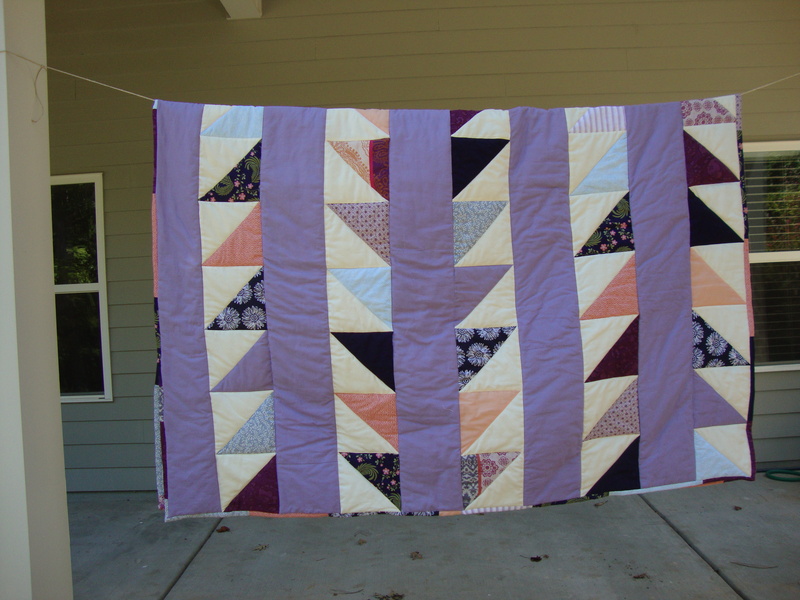 I have been looking around online at different quilts people have made, and when I stumbled across a pattern similar to this one, I knew it was one I could easily do. This time around, I really tried to shop for fabrics that would “match.” I picked 3 colors – blue (light and dark), purple and coral. 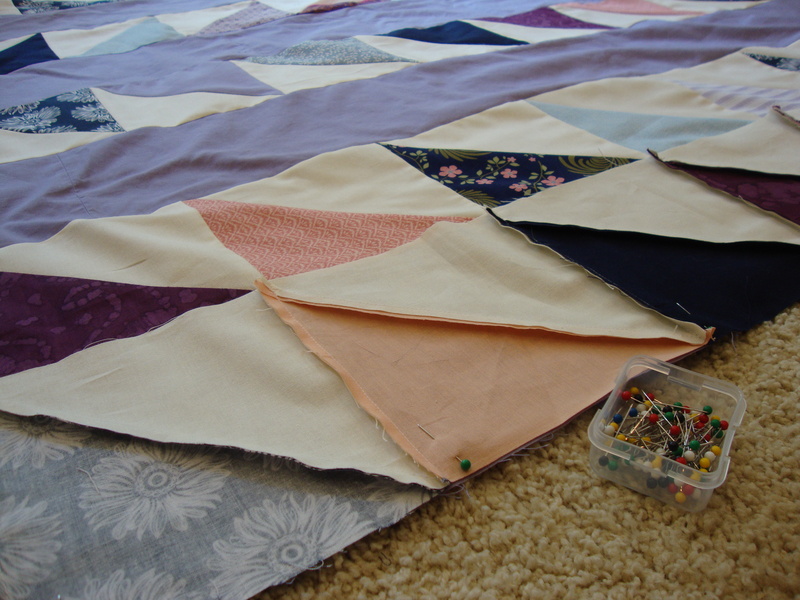 Together, I think the fabrics created a very cohesive quilt. 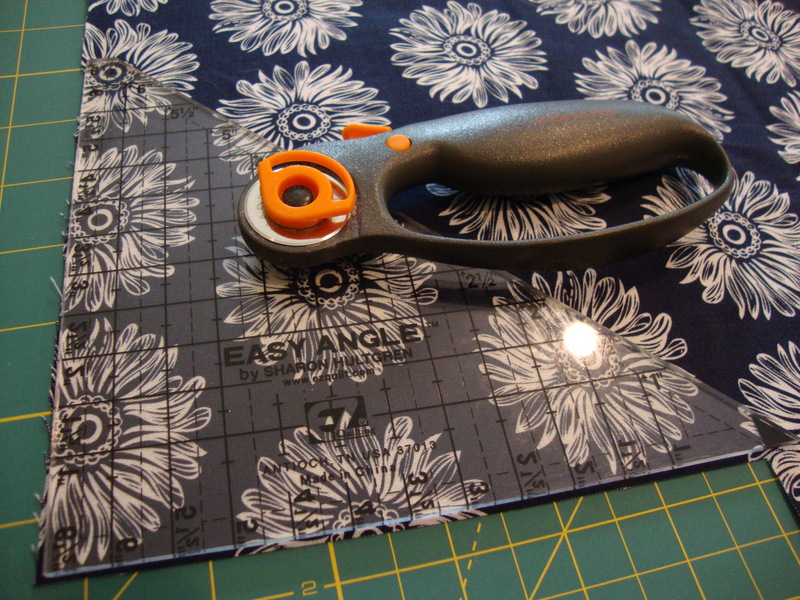 Quickly and easily, I created the squares that make up majority of the quilt. 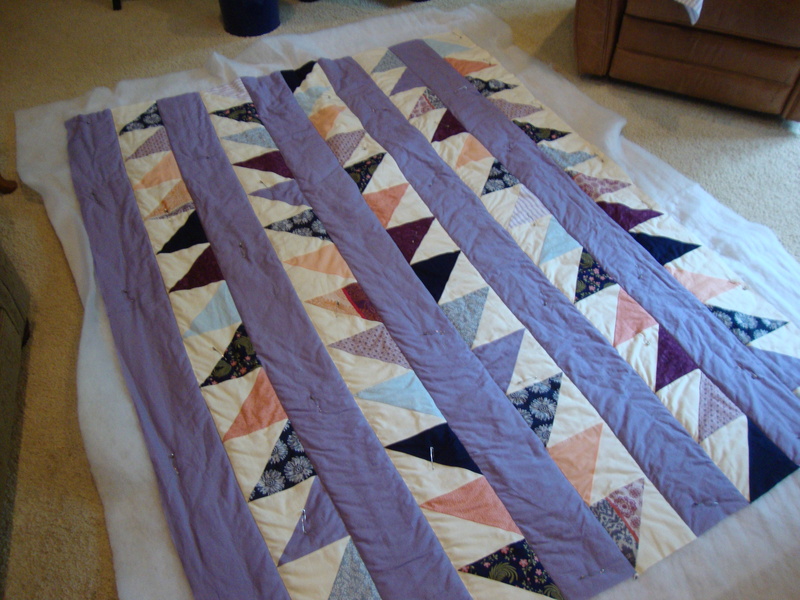 Each row was made up of 13 squares (26 triangles) with a total of 5 rows in the quilt. 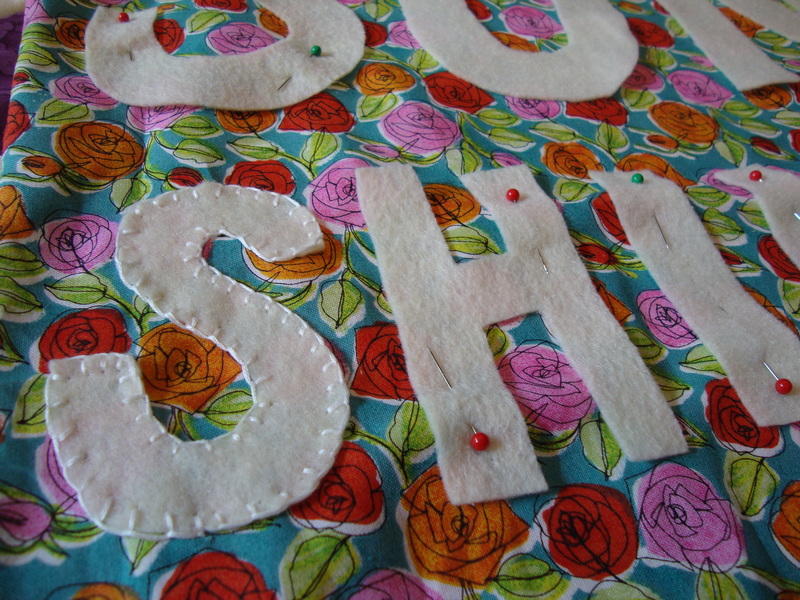 I laid out each square before stitching them together to make sure no 2 fabrics would be right next to each other. 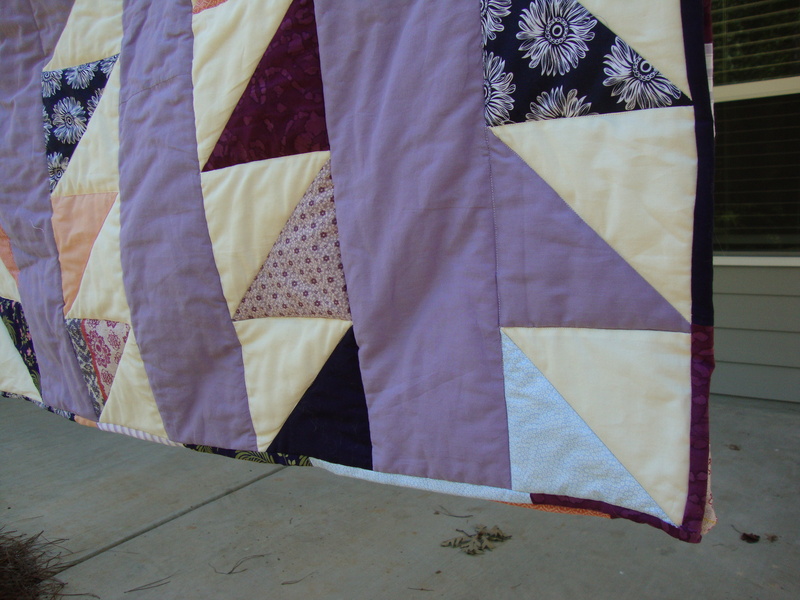 With the rows of squares complete, I then attached the rows of purple fabric. 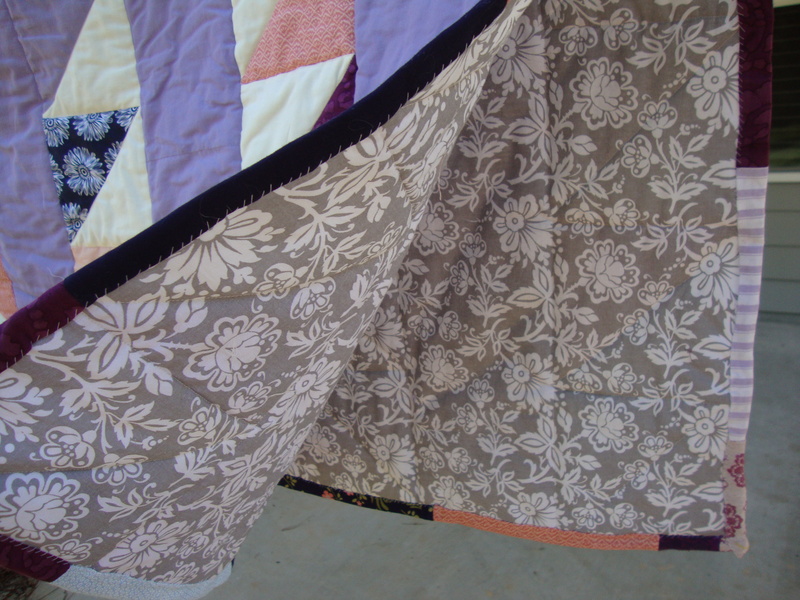 After choosing a back fabric (a grey, floral print), I attached the 3 layers (back fabric, batting and front fabric) and began the quilting process. 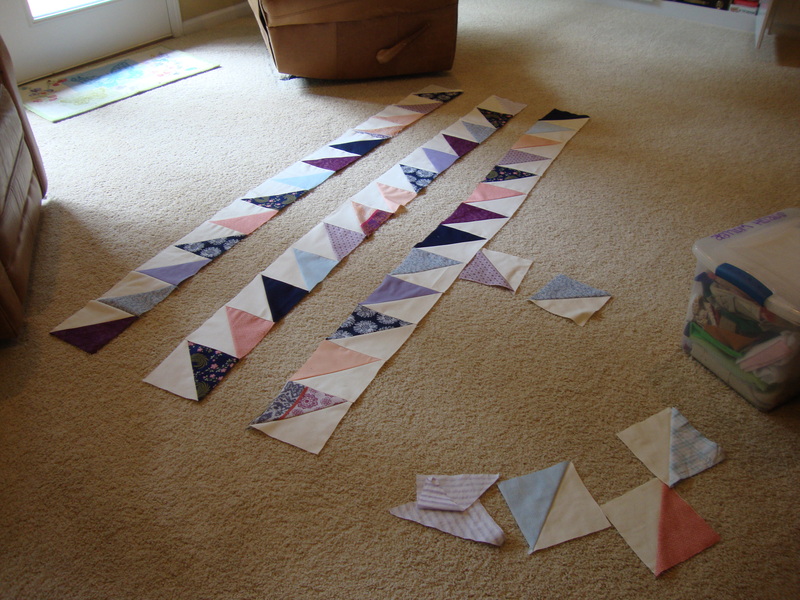 I chose to simply quilt straight lines, along each row and outlining each triangle. 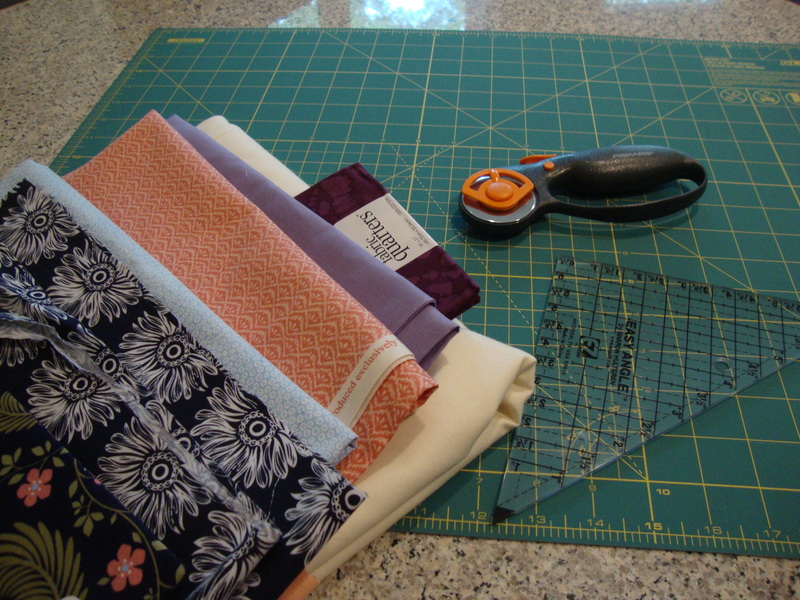 I created the binding using scraps from the triangles and simply sewed together a 2″x 276″ strip, attaching it with a 1/2 inch seam allowance on the front and top stitching on the back. 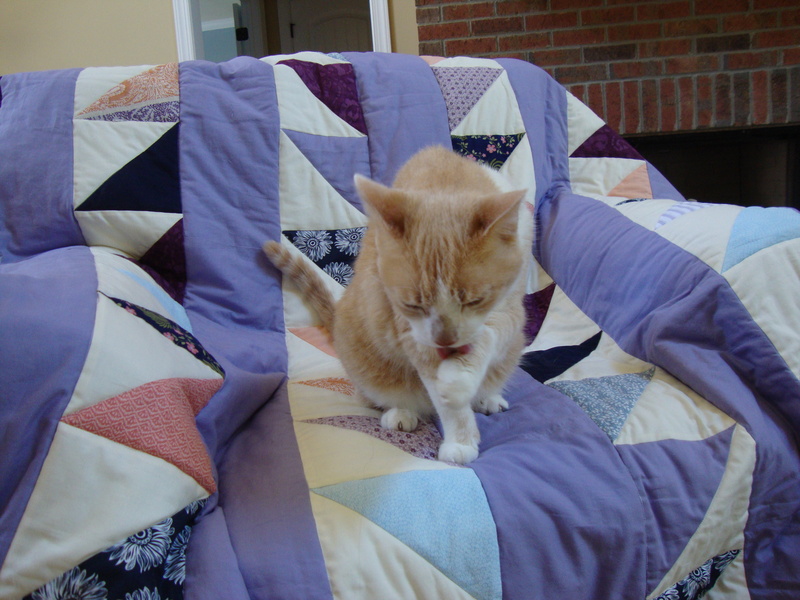 I purchased batting that was more plush than my previous quilt, and I think my cat very much approves of this decision.